The current generation Lincoln MKZ has been a Ford Fusion with a nice face and cushy interior. But for 2017, there’s a new one with a nicer face and even cushier interior. And a fire-breathing engine. 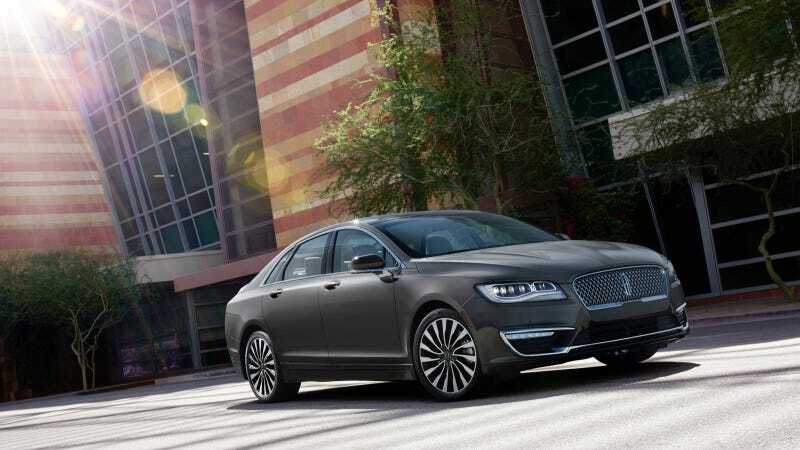 What do you need to know before you buy a Lincoln MKZ? Don’t worry, we’ll tell you everything right here in our Buyer’s Guide. I’ll sum up what you’ve heard about the MKZ in four words: “It’s a Ford Fusion.” That is pretty much 100 percent accurate. The one I drove was basically a Fusion Titanium 2.0 AWD with a different body on it. If you can buy a car that looks just as good as the MKZ, is similarly equipped to the MKZ, and drives exactly the same, if not a little better than the MKZ for $10,000 less, why would you buy the MKZ? There just isn’t enough differentiation to justify it. Just because the Fusion is a great car doesn’t mean it can move upmarket and still be a great car. What is exceptional in a midsize sedan is not exceptional in midsize luxury. It’s mediocre. But there’s good news, because the MKZ is getting a significant refresh for 2017. That includes a new 400 horsepower turbo V6, a fresh classy looking front end, and more tech. Hopefully that’s enough to distinguish this Ford CD4 Platform-based luxury car from its more bourgeois cousin from the blue oval. Aside from the new styling, the new MKZ promised new powertrains, a new interior and new fancy tech like radar cruise control, Active Park Assist and Active Lane Assist. But it didn’t seem much different from the Fusion, so when the production model, which looked very similar to the concept, went into production for 2013, we didn’t think it would sell so hot. Why buy the MKZ when you could buy a Fusion, which was basically the same car with a little less Bling? It turns out, we’re not always right, because Lincoln went on to sell so many MKZs that they couldn’t keep up with production. Okay, so they only sold about 30,000 a year, but that’s not horrible for this segment. The MKZ stayed virtually unchanged from 2013 until 2016, but the 2017 model gets an all new face, similar to that of the Continental. In addition, powertrains are new, with the old 300 horsepower 3.7-liter naturally aspirated V6 being swapped for a 400 horsepower, 400 lb-ft 3.0-liter turbo V6, the same engine found in the new Continental. The 2.0-liter turbo four gets a bump from 240 to 245 horsepower, and while there’s not much info on the hybrid powertrain, we do know that it will be a 2.0-liter mated to a CVT, so we wouldn’t be surprised if the horsepower figure was similar to the 2016's 188. Tech wise, the new MKZ gets auto-hold so the driver doesn’t have to apply the brake to keep the car from creeping. The park assist can now steer into parallel and perpendicular parking spots, the cruise control can now stop and resume driving on its own, and collision warning gets Pedestrian Detection. The interior gets some small tweaks from the outgoing model, and the old MKZ’s SYNC with MyLincoln Touch infotainment system gets replaced by SYNC 3. Lincoln doesn’t mention any tweaks to the suspension, so expect a MacPherson strut design up front and a multi-link in the back. The 2017 Lincoln MKZ comes in two versions: standard and hybrid, both of which start at $35,010, which is actually almost $200 cheaper than the outgoing model. The 2.0-liter turbo and 3.0-liter turbo engines come available with all or front-wheel drive, with the 3.0-liter being limited to only 350 horsepower (but still 400 lb-ft) in front-drive guise. Both engines have their power managed by six-speed automatics, while the 2.0-liter hybrid will only be available in front-drive and will come with a CVT. The base 2.0-liter turbo MKZ gets three “trim levels”: Premiere 100A, Select 200A, Reserve 300A, while the 3.0-liter gets only the latter two. The hybrid comes in those same three trim levels, but they’re denoted “Premier 400A, Select 500A and Reserve 600A,” though standard content is similar to the non-hybrid models. Standard features on Premier models include: dual-zone automatic climate control, 10-way power front seats with lumbar, driver’s seat memory, heated front seats, tilt/telescoping steering column, adaptive HID headlamps, push-button shifter, 18-inch alloy wheels, rearview camera, “Luxury Soft Touch” vinyl seats and SYNC 3 with eight-inch display. Drop $1,750 on the Select trim, and you’ll get leather seats, ambient lighting, illuminated scuff plates, Lincoln Approach Detection System (activates door handle and other lights when you get near the vehicle). Pony up another $2,750 for the Reserve group, and you’ll add navigation, Blind Spot Information system with cross-traffic alert and a power trunk with soft-close. We haven’t driven the updated MKZ yet, but based on the changes they’ve made, the Ford Fusion is likely to be a better value. We’ll have to wait and see to be sure, but we are intrigued by the 400 horsepower 3.0-liter all-wheel drive model and the Driver’s Package. That package adds torque vectoring, a sport-tuned suspension, continuously controlled damping, a unique grille, painted calipers and 19-inch alloy wheels. Those sound like nice things. We can’t wait to drive it when it comes out this summer.